Home / Freebies / Free Stuff Online / Salvation Army | Schedule a FREE Pickup Today! Finding yourself with too much stuff? 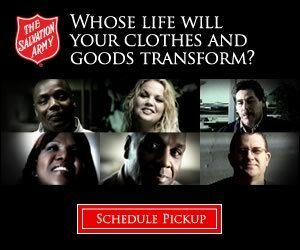 If you have items you want get rid of, you can now schedule a pickup from the Salvation Army online! This is perfect for bigger items that always seem so hard to get rid of. Just go HERE and enter your zip code on the ride hand side of the page. It will ask you to list specific items needed for pickup. Or else you can go to the bottom of the list and choose “Yard Sale Cleanout” if you have just lots of random items. This is a GREAT way to get rid of stuff just taking up space in your house or garage, PLUS you are helping a very good cause!